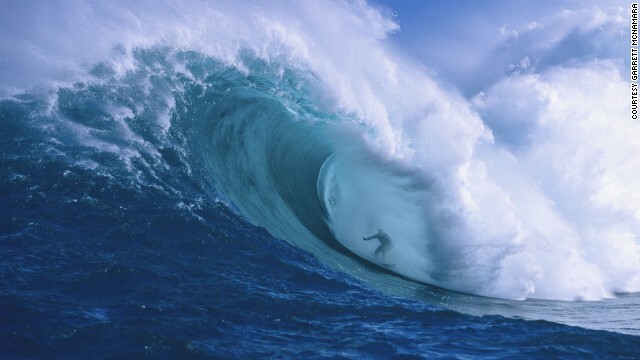 Earlier this year, I started surfing. One of the things that dramatically helped me maintain my footing was to look ahead. When you’re trying to catch a wave, after you “pop up” on your feet, if you’re looking down at the rushing water, you will just fall down. But if you’re looking ahead at the stable shore, you will magically stay balanced and much more relaxed. Look down and you’re screwed! But look far ahead at the stable shore and you’ll find your way there. I found this interesting because this same exact tip works for so many other sports: mountain biking, slacklining, canyon driving, traveling rings, you name it! 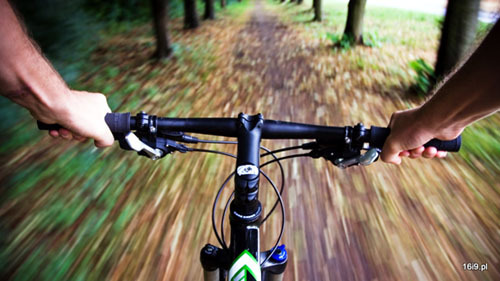 Mountain Biking: When you’re mountain biking downhill, if you find yourself constantly on the brakes and unable to let go, it’s very likely that you’re looking down right in front of you. Things are going too fast for you to process and you’re scared of what’s ahead, because it’s all coming at you so fast, so you’re going to try to slow yourself down. But if you simply look up and look ahead as far down as you could see, all of a sudden everything will be going much slower and the little details below you don’t matter too much anymore. You will instantly feel like you’re in control and can totally let go the brakes. If you’re looking down, things are gonna look like they’re going too fast! Slacklining: When you’re walking on a slackline, the line is always kind of moving and if you look at your feet it is very distracting. But if you gaze ahead it is very calming and centering. 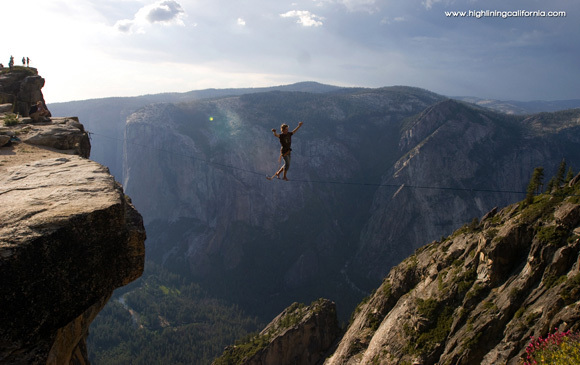 ‘Don’t walk while staring at your feet’ doesn’t hold anymore truer than during highlining. Traveling Rings: When swinging on the traveling rings, looking up at the top pole naturally gets you out of your head and in the zone. 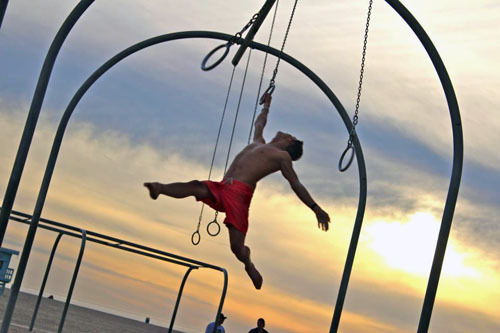 By disconnecting your vision from your surroundings, your body gracefully figures out the motions it needs to take to get to the next ring. 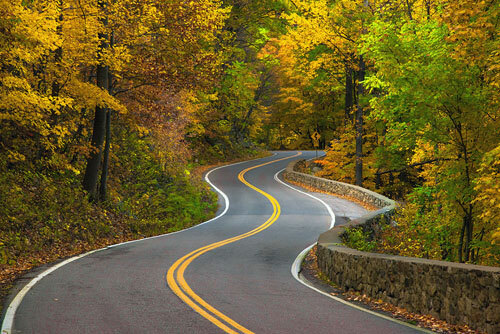 Driving: When you’re canyon driving, you need to be looking ahead as far down the road to as possible to take the proper line. You’ll also be aware of any hazards like fallen rocks or sand way ahead of time. Keep your eyes far down the line and you’ll find yourself taking the proper line to get there. I feel like all of this is symbolic to life in general. Looking up, looking ahead, not looking down at the ground… it’s all great for sports, but it’s also true for life! A lot of people get stuck on the tiny trivial details of the present moment without “looking ahead” at the big picture. Even worse is when it takes the form of “drama.” Please don’t give power, energy and attention to drama. It’s a waste of time and soul-sucking. (I try to not even acknowledge it when it is around me so I don’t feed it.) Forget the absolutely trivial things that will be completely irrelevant in a day or two. If we dwell on things that have already happened, things that we cannot change, it creates opportunity for sadness. If we worry about things that are out of our control, we create the opportunity for anxiety. So look up and ahead at your bright future! Make decisions that are intended for the long term and it will feel calming because it’s helping you reach your goals. That’s all I got for now. 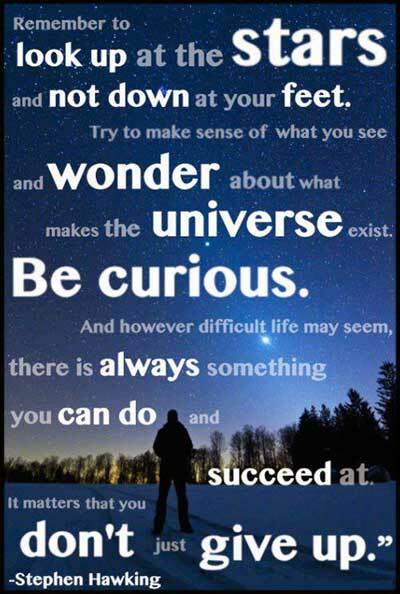 I’ll leave you with this quote by Stephen Hawking.